EAST RUTHERFORD, New Jersey -- Andrew Luck will be back under center for the Indianapolis Colts - and it's on his offensive line to help keep him there. 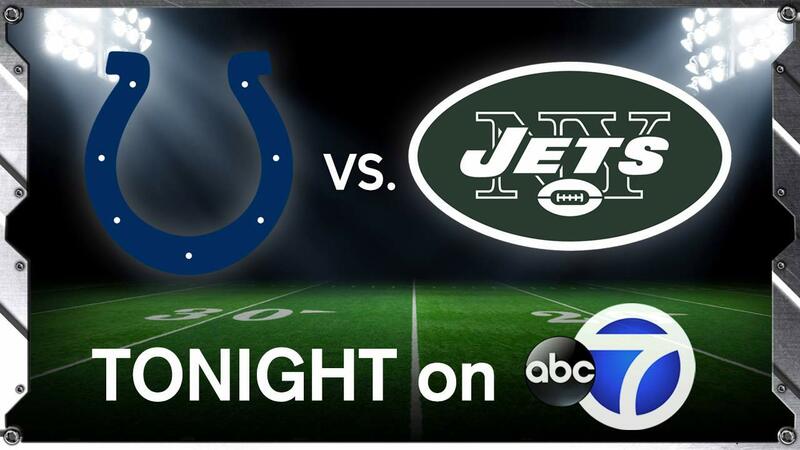 You can watch the Jets-Colts game tonight on Channel 7, starting with our special Countdown to Kickoff at 7:30 p.m., followed by the game at 8:15. See programming changes at the bottom of this article. "There's not any special adjustment," left tackle Anthony Castonzo said. "We're always trying to keep him protected. Knowing that he's coming off a concussion, we don't want him to get another one, so we just have to tighten up the screws on technique and just make sure you keep your guys away from him." "I think these guys are as good as anybody," left guard Jack Mewhort said. "A lot of talented guys, they have played a lot of football and we are aware of that, and we obviously respect that and respect what they have done. We know that these guys have the ability to wreck games." "When you look at all our guys, a lot of the things that's kind of happened when you make plays here or there, they're getting attention," defensive coordinator Kacy Rodgers said. "They're getting double-teamed, protections are a little different, everything. They're warranting a lot of attention, which they should be, but they're steady working and we'll get there." "They say the O-line has been struggling," Williams said, "but mostly what I see is that the majority of the sacks are just from the defense executing blitzes and pressures and stuff like that." "They are not a passive defense by any means," Luck said. "It's an aggressive-style defense. Any time in any game, you get blitzes. If you can pick it up, there are less guys in coverages, it is sort of simple. It can be an opportunity for a big play both ways and we'd like to make sure they are big plays in our favor." "Takeaways win games," cornerback Buster Skrine said, "and we haven't been getting them." "You try to get them in games," he said. "We swipe at the balls. We just haven't gotten them. Yeah, it's frustrating because we've got to get takeaways, and that's the biggest difference between this year and last year defensively: not many takeaways." Wheel of Fortune will air at 1:45 a.m. on Tuesday. Conviction will be broadcast at 2:15 a.m. on Tuesday.